Ships at berth range on their moorings due to forces and moments imparted by passing ships. This can cause large mooring line and fender loads and in extreme cases can result in damage to mooring infrastructure and dangerous situations for crew and passengers. Berthed ship motions also influence loading/unloading procedures and can reduce the efficiency of the berth. Therefore understanding the berthed ship – passing ship interactions is important for the safe and efficient design and operation of ports. The berthed ship motions are dependent on the form and magnitude of the interaction forces and moments, which are significantly influenced by the bathymetry around the berthed and passing ships. In general, a ship berthed in a narrow channel would experience greater surge force and a lower sway force and yaw moment compared to an equivalent case in a wider channel. Designing the mooring arrangement to minimise the berthed ship motions due to a passing ship is advantageous to increase berth efficiency, reduce loads on mooring infrastructure and increase safety for crew and passengers. 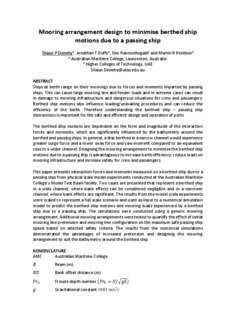 This paper presents interaction forces and moments measured on a berthed ship due to a passing ship from physical scale model experiments conducted at the Australian Maritime College’s Model Test Basin facility. Two cases are presented that represent a berthed ship in a wide channel, where bank effects can be considered negligible and in a narrower channel, where bank effects are significant. The results from the model scale experiments were scaled to represent a full scale scenario and used as input to a numerical simulation model to predict the berthed ship motions and mooring loads experienced by a berthed ship due to a passing ship. The simulations were conducted using a generic mooring arrangement. Additional mooring arrangements were tested to quantify the effect of initial mooring line pretension and mooring line configuration on the maximum safe passing ship speed based on selected safety criteria. The results from the numerical simulations demonstrated the advantages of increased pretension and designing the mooring arrangement to suit the bathymetry around the berthed ship.